Coach's Corner - 500 HR Hitters group signed/certified cachet FDC. Go Back to Lot List 500 HR Hitters group signed/certified cachet FDC. This 11-player signed gem is an original from Renata Galasso and is done in silk, dated, stamped and cancelled. 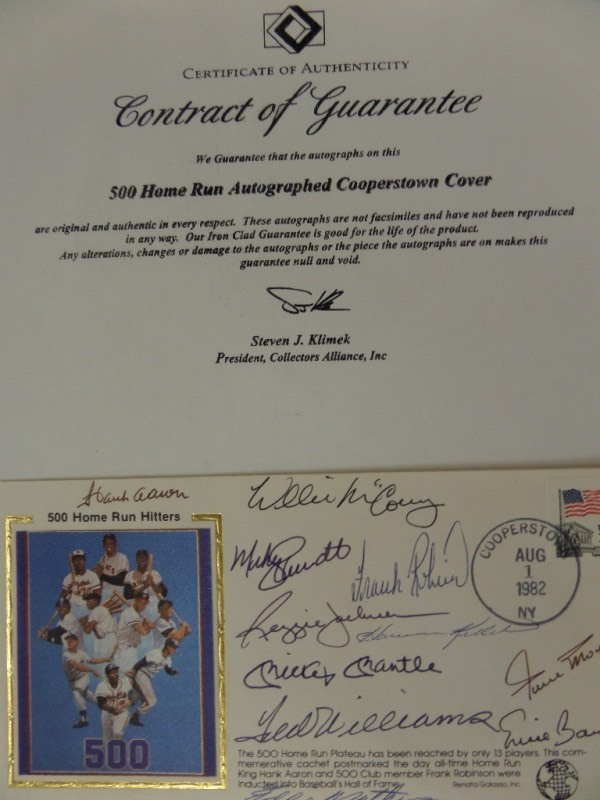 It comes ink signed by all 11 original 500 HR Hitters and comes with a Steve Klimek letter from Collectors Alliance, the group who put them out in 1990. It grades as good as it gets, is larger in size than a normal First Day Cover, and sold out FAST at $995.00 back in the day. Whats it worth now?